Physical therapists have many methods at their disposal that may help with your neck pain treatment. What you may not know is how beneficial electricity can be for your neck problems. Electrical stimulation therapy from Franklin Rehabilitation may have several key benefits for your neck issue. The team at Franklin Rehabilitation is proudly serving the Franklin, Wisconsin area with physical therapy. We believe that the most important part of any physical therapy program is the patient. This is why we’re always ready to listen to you and your therapy goals. We’ll then develop a personalized therapy plan that does the best possible job helping you reach those goals. 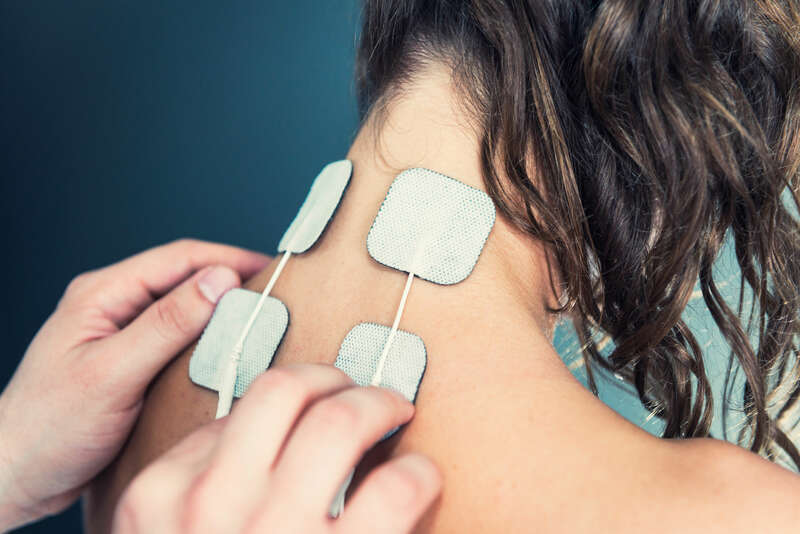 One type of treatment that we bring this personal approach to is neck pain treatment, and we may include electrical stimulation in your treatment because of the benefits it may provide. You may be seeking neck pain treatment from us for a variety of reasons. In fact, our team has experience helping people with many types of neck problems and injuries. We often find that neck problems are a result of muscle tension in your neck, shoulders or upper back. When these muscles are causing you to have neck issues, our team is ready to help with electrical stimulation therapy. This form of therapy uses low-power electrical pulses that may help relieve your muscle tension. Our therapy team will begin your electrical stimulation therapy by attaching electrodes above the problem muscle or muscles. We’ll then connect the electrodes to a machine that produces low-power electrical waves using wires. Once our therapist turns on the machine, electrical pulses will flow through the wires and into your muscles. Electrical stimulation may be very beneficial for your neck treatment at Franklin Rehabilitation. One benefit we may be able to help you achieve is releasing the tension in your muscles. Since this tension may be what’s causing your neck problem in the first place, this is a huge benefit. Our electrical stimulation therapy may have other benefits for your condition, too. One important benefit it may bring you is a significant reduction in your neck pain. The Franklin Rehabilitation team is ready to design the best therapy plan for your neck issues. This plan may include such beneficial treatments as electrical stimulation. However, the best thing you can do to start reducing your neck pain is to begin treating it as soon as possible. We’re ready to help you get started with a free 15-minute screening. Contact our team today for more information or to schedule an initial appointment.